Not to be confused with Wookiee, Wookie, or Wookey Hole. 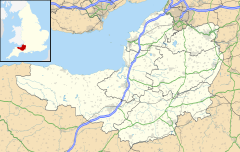 Wookey is a village and civil parish 2 miles (3.2 km) west of Wells, on the River Axe in the Mendip district of Somerset, England. Wookey is often confused with its sister village Wookey Hole which is perhaps best known today for the Wookey Hole Caves. The parish includes the village of Henton and the nearby hamlets of Yarley and Bleadney where the River Axe, travels the length of the village. There used to be a port at Bleadney on the river in the 8th century which allowed goods to be brought to within 3 miles (5 km) of Wells. One mile north-west of Polsham, but within the parish of Wookey are the earthwork remains of Fenny Castle, a motte and bailey castle sited on a natural hillock. The now-closed Wookey Station, once lying on Cheddar Valley line branch of the Bristol and Exeter Railway, is a geological Site of Special Scientific Interest. The village included a manor house built by Bishop Jocelin of Wells in the 13th century. It was rebuilt in the sixteenth century and is now a farmhouse and Grade II* listed building. The population in 1821 was 1,040, comprising 223 families, of which 147 were employed in agriculture. The National School was founded in the village in 1844 by St Matthew's Church. From October to December 1880, H. G. Wells joined the school as a pupil-teacher aged 12, following a relative who was headteacher at that time. It later became Wookey Primary School, a community primary for around 85 children aged 4 to 11 of Wookey and the surrounding area. The village falls within the Non-metropolitan district of Mendip, which was formed on 1 April 1974 under the Local Government Act 1972, having previously been part of Wells Rural District, which is responsible for local planning and building control, local roads, council housing, environmental health, markets and fairs, refuse collection and recycling, cemeteries and crematoria, leisure services, parks, and tourism. The village falls within the 'Wookey and St Cuthbert Out West' electoral ward. The ward starts near Wells and stretches via St Cuthbert Out to Godney.The total population of this ward taken from the 2011 census was 2,510. St Matthew's church dates from the twelfth century and is a Grade I listed building. It was granted to the dean of Wells by Bishop Robert, rebuilt by Bishop Reginald and assigned to the sub dean of the cathedral in 1209. The south chancel is thought to have been built to house the memorial to Thomas Clerke in 1556. Beside the church stands the Mellifont Abbey, which was once home to Sir Jacob Wolff, 1st Baronet, where a monument to him and his wife can be seen in the church. Mellifont Abbey is named after the abbey of the same name in Ireland. Wookey was the birthplace of the trade unionist A.J. Cook, and of Sir Arthur Pearson, the publisher and philanthropist. ^ "Wookey Parish". Neighbourhood Statistics. Office for National Statistics. Retrieved 1 January 2014. ^ a b c d Bush, Robin (1994). Somerset: The complete guide. Wimborne, Dorset: Dovecote Press. ISBN 1-874336-27-X. ^ Holmes, Thomas Scott. The History of the Parish and Manor of Wookey. ^ "Fenny Castle". Somerset Historic Environment Record. Somerset County Council. Retrieved 13 May 2011. ^ Historic England. "Fenny Castle (197243)". PastScape. Retrieved 13 May 2011. ^ Historic England. "Court Farmhouse (268186)". Images of England. Retrieved 26 November 2006. ^ Historic England. "Bishop's palace (1013588)". National Heritage List for England. Retrieved 25 January 2015. ^ "Somersetshire delineated, by C. and J. Greenwood, 1822". Google Books. Retrieved 25 October 2007. ^ Searle, Muriel (2002). West Country History: Somerset. Intellect Books. p. 119. ISBN 9781841508023. ^ "Wookey Primary School". Wookey Primary School. Retrieved 8 December 2012. ^ "Wookey and St Cuthbert Out West ward 2011". Retrieved 7 March 2015. ^ Historic England. "Church of St Matthew (268176)". Images of England. Retrieved 26 November 2006. ^ Historic England. "Mellifont Abbey (268182)". Images of England. Retrieved 12 October 2007. ^ "A.J. Cook". The Wales acrhive. Archived from the original on 17 September 2011. Retrieved 21 November 2010. ^ "Sir (Cyril) Arthur Pearson, 1st Bt". National Portrait Gallery. Retrieved 16 July 2018. Wikimedia Commons has media related to Wookey. This page was last edited on 11 October 2018, at 20:16 (UTC).